Visit harvardmag.com/ governance for more extensive coverage of the changes in governance, including historical context and links to the committee report and letter from President Faust and Senior Fellow Reischauer. 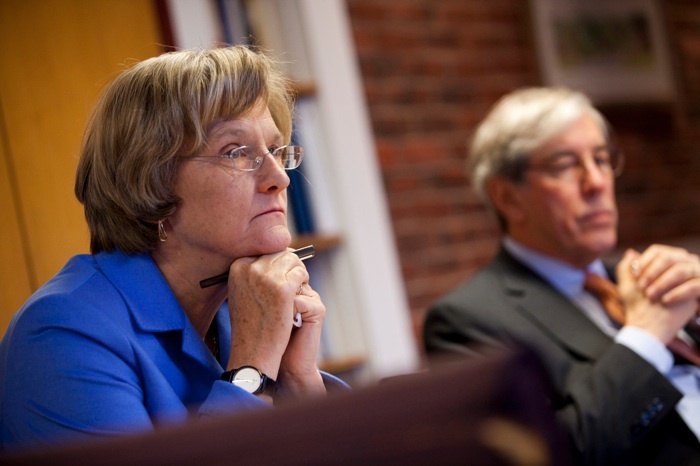 The Harvard Corporation’s self-review of its operations and organization--begun in 2009 and first disclosed to the community that December 15 by President Drew Faust--has culminated in a series of measures to modernize and, in part, refocus the work of the University’s senior governing board (formally, the President and Fellows of Harvard College). The changes, discussed with the Board of Overseers during the review and then aired and adopted jointly in a series of votes on December 4, are outlined in a five-page “Report to the University Community” by the Harvard Corporation Governance Review Committee, released on December 6. • Membership on the Corporation will increase from the University’s president and treasurer plus five Fellows (as constituted ever since the Charter of 1650), to a 13-member group (the president and 12 others, including the treasurer). The appointments required to fill out the new membership are expected to be made within the next two to three years. • Term limits. There will be a presumption of terms of service (“[W]e envision that ordinarily members will serve for six years, with the prospect of their service being extended for up to six years”). As to practices, the report outlines several subtle, but significant, reforms. • A lead trustee. The Senior Fellow will act as “a lead player within the board,” who will be “expected to take a more active part in framing Corporation agendas and setting priorities for its work,” a role that has heretofore been the president’s (as discussed in a Harvard Magazine roundtable, “Governing Harvard” May-June 2006, page 25). The Senior Fellow will, moreover, be chosen for the role by fellow Corporation members, rather than merely inheriting it through longevity; and will chair the new governance committee. • Outreach and communications. The Corporation and its members “will engage more with a broader range of University constituents, in both formal and informal settings”--an effort to improve its access to information and diverse views--and will through the president or Senior Fellow “report to the community at least four times” annually on its work. Fundamental to the success of the review, Faust said, was focused consideration of the simple but difficult question: “What is the work of the Corporation?” As Harvard has changed, in a world itself changed by closer international connections, information technology, and other factors, that question drove much of the thinking about changes in organization and processes. “Once we began our self-examination,” Reischauer added, “the nature of the agendas at the Corporation meetings began to shift”--toward strategic considerations bearing on the University five and 10 years hence. Faust said that Richard P. Chait, research professor of higher education at the Graduate School of Higher Education--an expert on higher-education governance and leadership who served as a counselor to the review committee (and was also a participant in this magazine’s 2006 roundtable)--had spoken memorably of boards’ role as a source of “insight” and “foresight,” as well as “oversight.” Reischauer said that establishing committees focused on some of the Corporation’s foremost fiduciary obligations--groups that could “drill deeper” into financial and capital-planning issues, and distill information and provide options to the other members--would enhance “immeasurably” the Fellows’ capacity to deal with strategic priorities and longer-term issues. Overall, Faust said, the Corporation-Overseers discussion of the changes had resonated with “the spirit of consequentiality and possibility” for Harvard. Reischauer said the formal changes in governance were of a piece with enormous changes within the central administration in the past few years--“in the capacity of the center to do good for the rest of the University” in spheres ranging from information technology to capital planning to enhanced “rationality” in the budgeting process. All of those improvements, he said, were important to the University’s core educational, research, and academic mission. In this sense, Faust said, “Strengthening the Corporation strengthens the context in which to undertake those activities” at the heart of Harvard. According to the report, changes in Corporation structure and operations are based on several premises. • Capacity. The Corporation’s “collective capacity needs to be commensurate with the University’s scale, scope, and complexity”--suggesting that a body comprising the president, treasurer, and five Fellows is too small and too limited in expertise to fulfill its responsibilities relative to the twenty-first-century research university. Note that the review did not recommend something wholly different. It concerned the Corporation, not Harvard governance or administration overall. The review did not call for a single, larger board of trustees superseding both the Corporation and the Board of Overseers, with or without elections for some or all of those trustees. Reischauer observed on December 5 that the dual board structure “is a strength of Harvard,” and has the potential to become even more so, given the boards’ different memberships, sizes (the Board of Overseers has 30 members, plus the president and treasurer), and skills. The latter responsibility is a familiar one: stewardship of the endowment through the Harvard Management Company’s investment activities, and determining the funds to be distributed in support of current operations. This issue has arisen repeatedly in recent Harvard history. Faust said that President Neil L. Rudenstine described the Corporation functioning as a “plural executive” during his administration, meeting frequently and engaging in all sorts of transactional and other matters. She said that during the past few years, that “collective-executive” role had lessened, in her experience, as the Corporation appropriately prepares to undertake a different, more strategic, kind of work. A principal idea emerging from this magazine’s roundtable on governance was that the Corporation ought to routinely overcome the “warping effects of opaqueness” (in Chait’s term) by issuing statements on its activities, briefing the community on its operations and priorities, or otherwise instituting regular channels of outreach. In one sense, the Corporation review is an exercise in modernization. Instituting committees dedicated to finances and to facilities and capital planning is a sound practice for a fiduciary board of trustees--all the more so after the jarring financial experiences of the past two years. Moreover, these committees align with improvements in Harvard’s administration of the sort that Senior Fellow Robert Reischauer mentioned. A University-level Financial Management Committee now coordinates budgeting, financial planning, cash management, and Harvard Management Company’s investment operations. And as reported, executive vice president Katie Lapp has made creating a capital-planning and -budgeting process one of her highest priorities (see “No Surprises,” page 50). These steps, in the central administration and on the Corporation, should make uncoordinated or especially risky construction and financing decisions less likely than in the past; put positively, the University should be in a better position to identify and pursue some of its highest priorities for critical facilities and other investments, come what financial circumstances may. Turning to the present, the Corporation is emphasizing the importance of a large capital campaign--both because Harvard’s last campaign concluded in 1999, and because current circumstances (the reduced endowment, increased scholarship support, and the likely pressure on federal sponsored-research funds) make it urgent. What today seems perhaps the fuzziest of the Corporation’s professed new aims--the commitment to “weigh the major strategic challenges and opportunities facing Harvard”--may, in time, become the most important outcome of this self-examination. The University president is always enormously busy--all the more so as students, scholars, and alumni are active around the world, and particularly during preparations for and the subsequent launch of a major capital campaign. Harvard remains highly decentralized academically. There is rarely enough time for administrators to undertake thoughtful, deliberate strategic planning. The University has much to gain from the president and administration engaging broadly in such strategic planning, too, above and beyond whatever work is done to identify immediate priorities for a capital campaign. The Corporation is organizing itself to look forward strategically. And the Overseers have progressively broadened their oversight visits from focusing on individual departments and schools to examining overarching subjects, such as the libraries, the College, the social sciences, the natural sciences, and so on. Looking further ahead, the Harvard of 2020 will likely be still more international than it is today, its libraries more digital and accessible, its departments and disciplines both deeper and more collaborative. The University may have made tangible progress in realizing Faust’s vision for extensive growth in a wide range of creative and performing arts within the curriculum. And it may be on the verge of identifying wholly new priorities as well.